During the Great Upheaval of 1755, the British forced the Acadians to leave their homes in the Canadian Provinces. Fourteen-year-old Marie Landry and her family thought they had found a new home in Maryland, but ten years after the Great Upheaval, they must join a mass exodus to Louisiana where land awaits them. In this heartfelt collection of diary entries, Marie documents her journey. Beginning with Marie’s fourteenth birthday when she received the diary, eleven chapters of this historical fiction document her exile with the Acadians following their expulsion by the British. Marie reminisces about her family traditions in Maryland and recalls the illness she experienced while sailing aboard the Elizabeth in the Atlantic Ocean. After reaching the Mississippi River, Marie expresses the excitement she felt the first time she saw the waterway and tasted Creole food. Marie also conveys the feelings of joy and sadness that she experienced throughout the journey. In addition to a historical note, the book provides an accurate description of Cajun culture and illustrations of Marie en route to Louisiana. Stacy Demoran Allbritton is a former French and English teacher at Salmen High School in Slidell, Louisiana, and the founder of the school’s French club, Le Cercle Français. Allbritton is a recipient of the James Whitlow Award in romance languages from the University of New Orleans, where she earned a BA in French and an MA in romance languages. Allbritton is a member of the Association of Writers and Writing Programs. She divides her time between Jonesboro, Louisiana, and Paris, France. Joyce Haynes received her BA from the University of Southwestern Louisiana in Lafayette. She has worked as an art director, a children’s book illustrator, and a designer. Haynes is the recipient of such accolades as the Judges Choice Award in Best Illustration from the Missouri Advertising Managers’ Association. She is also the illustrator of Pelican’s Eyr the Hunter: A Story of Ice-Age America, Jane Wilkinson Long: Texas Pioneer, Nana’s Rice Pie, and When the Great Canoes Came. Haynes lives in Pineville, Missouri. This YA novel brings Louisiana history to life through the eyes of young people. Great story - couldn't put it down. Finally someone has told a story of the Acadian Exiles and their journeys, hardships, and perseverance while traveling to the Gulf of Mexico. So little has been written about this aspect of Cajun culture until now. 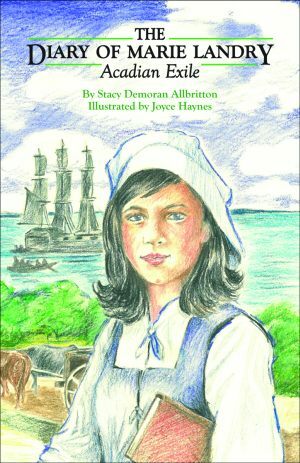 Click here for the teachers' guide for The Diary of Marie Landry, Acadian Exile.